Classic video slots still draw in the crowds in land-based casinos the world over, and it’s no wonder that they continue to be crowd-pleasers wherever you play them: they’re fun, fast, generally have a decent range of betting options, and some good jackpots. Done properly, those classic slots can be as exciting online as they can in the midst of a bank of button-bashing slots maniacs. OK, so the bells, whistles and whoops of joy may be missing (unless you’re particularly fond of a whoop and holler in your front room when you hit five Wilds) but the thrills are there all the same. 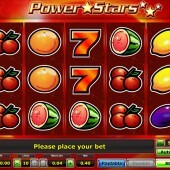 In slot developer Novomatic’s 5-reel homage to the classic slot, Power Stars, all the requisite classic icons are present and correct across its five reels: melons, oranges, plums, lemons, grapes, cherries and bells. Some effective casino sound FX play out during the reel spins. The red 7 pays out the biggest whack – 1,500x your line bet. And although the game has only 10 paylines, a top bet of $10 a line should keep the big bettors interested. It's All About the Power Star! The clue to the big symbol of the game is in the name of the slot. 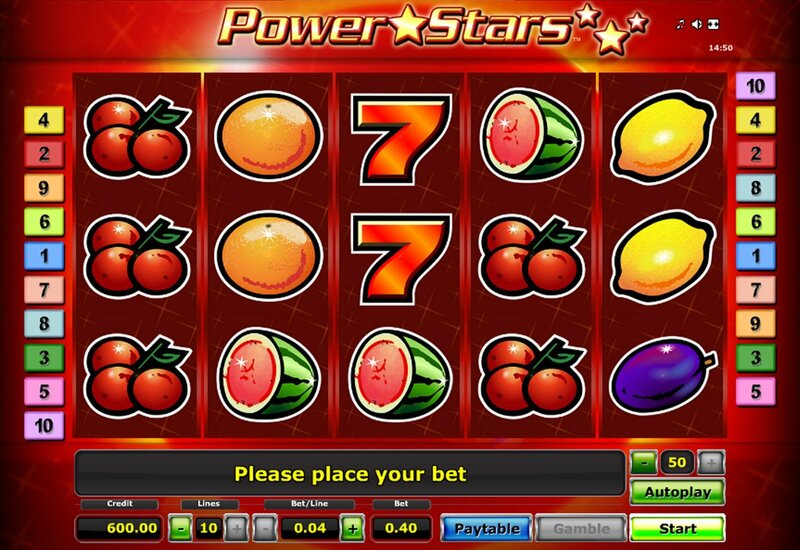 Look out for the gold Star icon, as this ‘Power Star’ is the real ‘star’ of the slot. The Star acts as the game’s Wild, substituting for all other symbols to form winning combos. It only appears on Reels 2, 3 and 4, but when it does it expands to fill the entire reel. It will then be held in place while the reels around re-spin. Further Power Star icons that crop up will then expand and hold in a similar way. It’s a great little feature, and one that triggered quite a lot when I played. With only 10 paylines, and no other bonus features, this classic-style slot was going to have to entice in other ways, and Novomatic’s game certainly entices in similar ways to its other popular slots including the Egyptian-themed Book of Ra Deluxe and its other nod to the classic slots genre Reel King . The variance may be high, with the jackpots in the game not likely to set the world alight, but with the unique expanding Wild system, Power Stars could be the fruit-based fare you’ve been looking for. It takes the feel of a classic slot and evolves it to another level. For other classic fruit-based games, make sure you check out Microgaming’s jungle-themed Mega Moolah and the similar Big Kahuna from the same developer: both combine old-school fruity action with some eye-watering progressive jackpots.